“Social media” is a term defining websites, messaging platforms, or other types of media that are used for social networking. A medium is considered social if it enables people to interact with each other. Individuals connect with each other through social networks by creating and sharing content, information, and ideas. Some of the most popular social media platforms include Facebook, Twitter, and Instagram. MIT’s social media guidelines are designed to help staff, faculty, and students who use social media to promote MIT activities, groups, or initiatives. These guidelines do not replace existing MIT policies or procedures, including the MIT Policy on the Use of Information Technology Resources or the Athena Rules of Use. 1. What are the goals of your department? What does a successful media strategy do for you? 2. Who is your target audience? What do you want them to do? 3. How much time will you dedicate to creating and updating content? Who will do the work? How frequently will you publish, and is your plan sustainable? 4. There are several social media networks available. Considering your responses to questions 1-3, determine which will serve you best. 5. What type of content will you share? Just text? Photos? Both? 6. How will you engage with your audience and promote their interactions? How will you go beyond broadcasting to make your media social? Read Does Your Department Take the ‛Social’ Out of Social Media? If you need help determining which social networks are best for your department, contact us. We offer free social media strategy advising. Whether you consider yourself a novice or an advanced social media user, talking with a professional outside your department can give you the perspective you need. Name. Always identify your account as part of MIT. This will allow users to search for you. For example, “Department of Physics” could belong to any school in the world, yet there is only one MIT Department of Physics. Username, handle, and vanity URL. Your username should be short and contain “MIT” if possible. For example, the School of Architecture and Planning (SA+P) is known on Twitter as @MITSAP. Avoid underscores “_”. Profile image. Use your department’s logo with a file that is at least 300x300 pixels. If your department does not have a logo, use an iconic image that represents your department. See the Social Media section of MIT’s Graphic Identity website for guidance. If you would like to have a social media profile image created for you free of charge, contact us. Background image. Some social networks require a background image. Do not use a default background provided by the network. Privacy and visibility settings. On many social networks, your privacy settings will be set to “public” so anyone can view your content, much like a website. If you are creating a community for one target audience, such as alumni, you may choose to set the privacy to “members only” to preserve the authenticity of the group. When you post to third-party social media outlets on behalf of MIT, you are representing the MIT brand. Here are some simple guidelines to help you promote the brand standards of the Institute. If you have specific questions on branding, please contact Communications Initiatives. Always begin with MIT when creating a name for your Facebook page, Twitter page, or blog (e.g., MIT School of Science, MIT Media Lab, etc.). Use of the MIT logo is reserved for MIT’s institutional pages. Departments should not use the MIT logo as their profile image. They may, however, overlay the MIT logo on the corner of cover photos and backgrounds. Departments, schools, or labs should use their official logo or an iconic photo or image that is representative of the organization. See the Social Media section of MIT’s Graphic Identity website for guidance. Follow all MIT identity guidelines. If you have questions, contact us. MIT promotes transparency. We recommend that you do not blog anonymously or use pseudonyms or false screen names when posting or creating a page on behalf of MIT. Is it an appropriate relationship? Is there a chance for misinterpretation from your audience? Slow down—think before you post. Consider the content carefully and be cautious about disclosing personal details or making statements that you may regret later. Do not turn into a one-way broadcaster; this defeats the purpose of social media. Read Does Your Department Take the ‘Social’ Out of Social Media? It is not always advisable to block comments just because they are negative. Use negative comments as an opportunity for discussion. Read more about the Do Not Delete Rule. It is perfectly acceptable to talk about your work or have a dialogue with the community. However, it is not okay to disclose personal, confidential, or proprietary information concerning the Institute or any faculty, staff, or student in any form of media. Sharing this type of information, even unintentionally or in good faith, can result in legal action against you and/or the Institute. Be careful about disclosing information about research in your department. If you are unsure about sharing the details of ongoing research, ask before posting. It is critical that you show proper respect for the laws governing intellectual property, including patent, copyright, trademark, and fair use. MIT has specific policies regarding the use and ownership of intellectual property. Read more about intellectual property, copyright, and Athena Rules of Use. When quoting someone else’s work, it is best to only use short excerpts and credit the original author/source. It is also good practice to link to others’ work rather than to reproduce it. Don’t take a screenshot of a tweet and post it on your blog. Instead, embed the tweet. We live in an electronic age that makes it easy to share and download content, such as music and photos. Remember that the laws of the physical world still apply to the electronic world. Just because it’s online and easy to grab doesn’t mean it’s yours for the taking. Respect your audience, MIT, and your coworkers. Members of the MIT community reflect a diverse set of customs, values, and points of view. When speaking on behalf of MIT, don’t be afraid to be yourself, but do so respectfully and with good judgment. When posting on behalf of MIT, it may be best to avoid controversial issues and inflammatory topics. When representing yourself in social media, be clear that the views and opinions expressed are yours alone and do not represent the official views of MIT. Still, your audience may attribute your comments to MIT, so be mindful of how they will reflect on MIT and its reputation. Make sure you understand MIT’s policies on personal conduct, racism, and harassment. Be the first to respond to your own mistakes. If you make an error, be up front about your mistake and correct it quickly. If you choose to modify an earlier post, make it clear that you have done so. If someone accuses you of posting something improper, such as their copyrighted material or a defamatory comment about them, deal with it quickly. It’s better to remove it immediately to lessen the possibility of a legal action. Comply with the terms of service of third-party entities. Most social networking sites have their own rules, policies, and procedures, and you will likely be required to accept their terms of service before you can begin to use them. It’s always good to familiarize yourself with these rules so that you can be sure you are able to comply with them. Follow MIT’s policies and procedures. MIT’s Policies and Procedures provide advice to MIT staff, faculty, and students who use social media to promote an MIT event, initiative, or academic program. They are not intended to replace any of MIT’s existing policies and procedures, which prevail over these guidelines. Social media is robust and timely for a reason: It’s real-time, community-generated content. These conversations can often add value, yet there are occasions when you may need to respond to questionable comments. Creating and posting response guidelines can help you navigate these occasions. Do you respond to every mention or just those that suit certain criteria? What will your response time be? Respond publicly to negative comments, but take the discussion to a private space as quickly as possible (e.g., “We are so sorry you’ve had a negative experience. Please private message us with your email address so we can help you resolve the issue.”). MIT ‹your organization name› has created this page to provide a format for discussion about news and events related to ‹subject matter›. MIT ‹your organization name> reserves the right to remove any content that is deemed, in our sole view, commercial, harmful, inappropriate, erroneous, harassing, libelous, threatening, discriminatory, or wildly off-topic. MIT ‹your organization name› reserves the right to remove you from the community/block you from posting after the second offense. MIT ‹your organization name› is not responsible for the content posted by others on this page; please note that community-contributed content is the opinion of the specific author and does not necessarily represent the opinions of MIT ‹your organization name›. Thank you for your presence and comments and for your role in creating a safe and dynamic environment for our online community. MIT ‹your organization name› abides by Facebook’s Terms and Conditions and asks you to do the same while in this community. The metrics of your social media campaigns are dependent on your goals. You must determine your objectives and develop a vision for what success means to your department. Determine the social media metrics that reflect your goals. For example, do you want more people to apply to your program? If so, the number of followers isn’t as important as the number of clicks your application page receives. Use tools to help you aggregate and analyze your data. Some social networks provide data for download, such as Facebook Insights. Other networks can be analyzed more easily with third-party tools. Is your social media activity focused on improving the metrics that matter? Does your content promote engagement? What types of content are working best? What types of content are the least successful? Read the MIT Social Media Hub blog. Review the websites and mobile apps of other universities. If something interests you, contact that department to inquire about their approach. Schedule a meeting with Jenny Fowler, MIT’s manager of social media strategy. This is a free service for MIT staff and faculty. Identify the trends and technologies you should follow, and consider how to incorporate these new methods into your social media strategy. Change is inevitable. Be willing to consider how new approaches fit into your overall strategy. If you want to explore a new approach but have reservations, consider testing concepts and tools on a small scale, then refine your overall strategy based on the outcomes. Submit timely videos (if related to an event). Create mp4 files of appropriate length for the platform (<1:00 for Instagram; <2:20 for Twitter). Include an .srt file for captioning; if your request is for Facebook, use the Facebook naming convention for .srt files. Provide a title and description for the video (1-2 sentences). Please note that we do not post duplicate content, and we may not necessarily post every video in a series. 85 percent of viewers on Facebook watch video without sound. Video posts on Facebook have a 135 percent greater organic reach than photo posts. Shorter videos play better on mobile devices (longer videos still have a healthy desktop audience and increasing viewership on tablets). To submit videos for consideration, email the Social Video Team with a brief description of your video. They will follow up with information for sending the video file. Learn how to brand your social media account. Access online social media courses taught by industry experts. An MIT certificate is required. Access photos for use in your social media posts. Obtain a signed release form from anyone who is recognizable in your photos or videos. Explore MIT through social media. Read about current trends and best practices. Join the conversation and share knowledge with your colleagues. 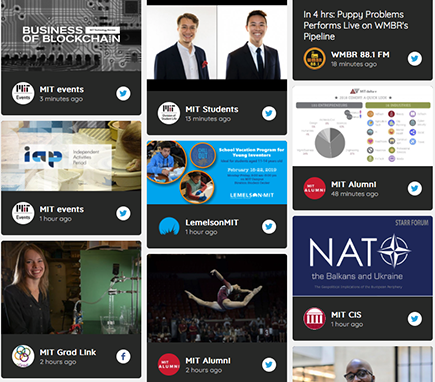 MIT Social Media Hub is the Institute's portal for all social media content.